Welcome to the Jewish Enrichment Center! TWO weeks of Jewish Enrichment Center Camp! Last two weeks of August. Enroll here (And mark your calendars for Jewish Enrichment Camp during Spring Break, too!). Yom Miyuchad (Special Days) – When school is out, your children can still play with their Enrichment Center friends and do extraordinary Jewish exploration, too. A Leadership (Madrichim) program for entering 6th – 8th graders. As always, our kevutzot (groups) are multi-age and based on developmental needs of children. Our younger children engage in play-based Jewish exploration, with lots of support in growing their social and emotional skills for group play. Older children transition into Jewish exploration in which children and educators work together to guide the course of their final projects, greater leadership, and continued attention to skills needed for collaboration and ownership of their own Jewish paths. Read more about each kevutzah (group) here. Sessions are available on Sunday mornings, Monday, Wednesday, and Thursday afternoons. Children in Kindergarten and older explore at the Jewish Enrichment Center at least two sessions/week. Enrollment consists of a registration form and payment. Registration will not be processed until payment is received. Registration for returning families is available here. Registration for new families is available here. 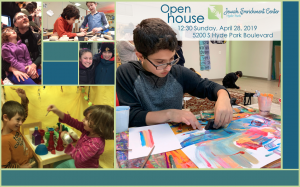 Please contact Rabbi Rebecca Milder at 773-234-9403 or jewish.enrichment.center@gmail.com with questions. Ready for an extraordinary year at the Jewish Enrichment Center? Please call or write with any questions: 773-234-9403 or jewish.enrichment.center@gmail.com. Please fill out a separate form for each child. A $50/child deposit is due with this registration form. Let the next extraordinary Jewish enrichment adventure begin. We love to hear from you. Please be in touch! 773-234-9403 or jewish.enrichment.center@gmail.com Only one form per family is necessary. New to the Jewish Enrichment Center? Welcome! Call Rebecca and introduce yourself and ask anything you’d like! (773-234-9403). Also, please fill out this form so we can help keep your child/ren safe.